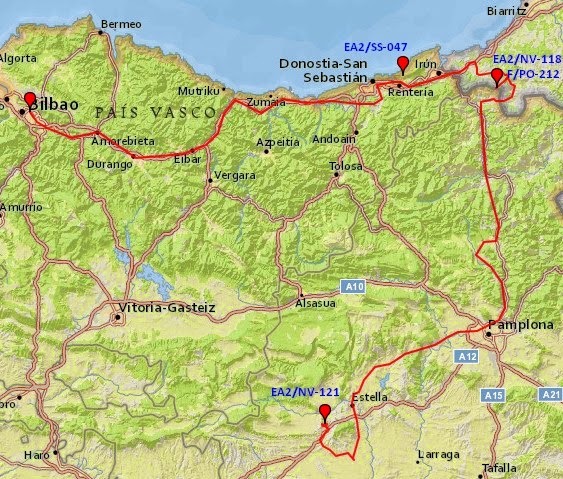 Even the weather was not the best, and being with my son this week, we decided to make a 3-4 days trip around Euskal Herria. 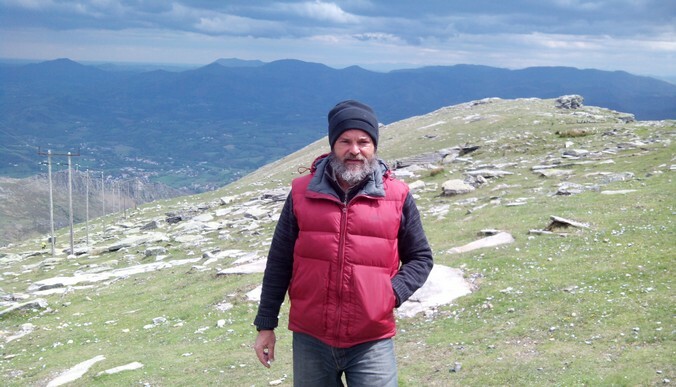 Our goals: activate some SOTA summits valid for the Euskal Herriko Mendiak award, visit the Eureka Science Museum at Donostia-San Sebastian, and pay a short visit to my sister and nephews at Allo, Nafarroa. That was the plan. So, on tuesday 22th, we rented a small car (as I have just my motorbike, and my son is already too young to share it with) and started our trip towards Donostia. As we planned, we spent all day at Eureka! Science Museum. 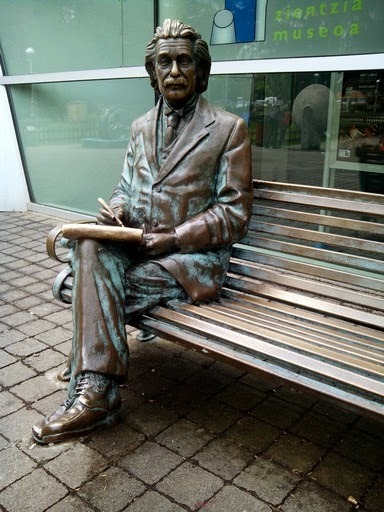 This is mainly oriented for the young people to experiment with many phenomenae of the nature (weight, electricity, gravity, fluids, sensorial perceptions, and so.) and its aim is to be accesible to them. They can see, touch, smell, hear, anything. This focus generates a lot of questions too... but it well deserves a day-long visit. I have expected that perhaps, after the visit, we would have some time to activate Jaizkibel EA2/SS-047 at Lezo, about 20 km. from Donostia, but at last, we have so many work at the museum, (plus a last hour visit to the planetarium) that it was imposible. I was only able to have at sight from our hotel, an ancient forest house today turned onto a cheap and well managed hotel. Next day, wednesday, we aimed to activate a long waited one, Larhun (La Rhune, Larrun) double referenced as F/PO-212 and EA2/NV-118, near Askain, between Lapurdi and Nafarroa. 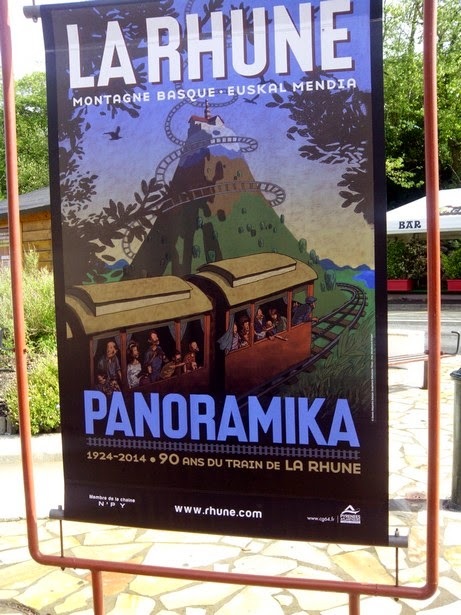 So, we followed our route through Gipuzkoa to Urruña, Askain, finally arriving to the "Col of Saint Ignace", where a small mountain train carries you to the very summit in a 30' trip across beautiful first Pyrenees, close to the Biscay Bay. As there were a lot of tourists from France (on holidays onthese days) we had to wait more than one hour to take the train. Down on the starting station, the sun was shining and the temperature nice, but as we started the climb, the weather was rapidly getting worse. Once at the summit, we made out from the AZ while watching the amazing views around. Not during too much time, as a dense fog and some suspicious clouds were carried by a pretty strong wind from the west. So, while Oier was researching around the zone, I mounted quickly the rig, and started operating. First the F/PO reference, no more than 30 min. and the EA2/NV, this last only during 10 min. The rain had already started, and the temp was going low. After the descent, now really cold, and eating some sandwiches, we headed to Nafarroa,not without a planned stop at the gardens of Bertiz (at Oieregi). On the first 1900s a man who went to "the Americas" to "make fortune" came back and spent most of the money earned on building a small palace and a garden, having specimens for a lot of countries from all the world. After his death, all was donated to the Nafarroa people for their enjoyment. Nowadays, it receives a lot of tourist, and it's very well set to that. 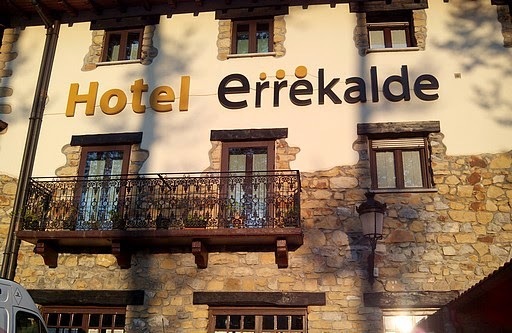 After that, we arrived to Estella Lizarra, and spent the night. Thursday morning, we met my sister and her two sons, Ibon (10) and Peio (9), at Allo, where they live. 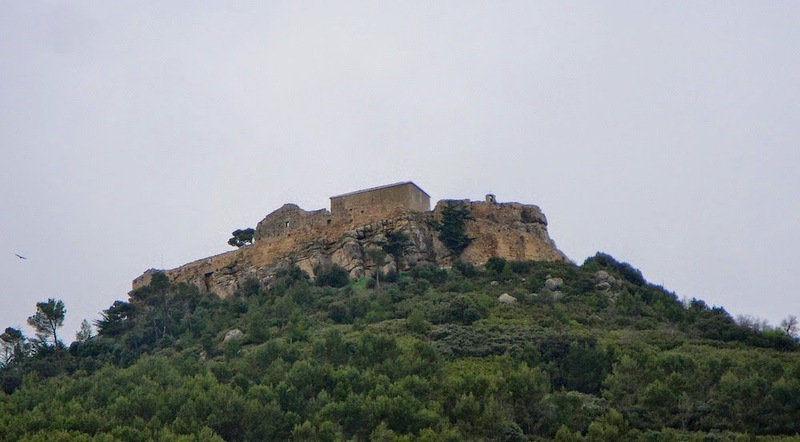 After the meet, we all went to Villamayor de Monjardin, at about 20km, to make the second activation, the Castle of Monjardin, EA2/NV-121. It was a 2 km path from the village to the summit, quite easy, but with the weather turning stormy again. We reached the castle (unfortunately closed) in half an hour, and, while the children started remembering old fights, I set up quick all the equipment. Just it was time enough to make a dozen of QSOs when the rain started, and as the youngest couldn't play anymore, the activation was ended quite fast.